Said to be the sunniest of all Greek islands, Zakynthos is also one of the greenest. In the spring and late September, wildflowers cover the hills, making it an ideal destination for those who seek to be surrounded by natural beauty and a little off the beaten path. Located at the southern end of the Ionian Islands group, Zakynthos features beautiful scenery and excellent sandy beaches where it's easy to imagine you've been shipwrecked on your very own deserted paradise. In fact, one of the island's most popular excursions is to a small stretch of beach, called Navagio, accessible only by boat where the remains of a shipwrecked vessel poke through the sand. Other must-sees include the spectacular Blue Caves where the pounding sea has carved amazing grottoes and the annual migration of Kareta-Kareta loggerhead turtles who travel from Africa to nest on Zakynthos' beaches. It is an island of big contrasts for the presence of golden beaches and massive rocky coasts. Zakynthos benefits from a Mediterranean temperate climate with mild winters and cool summers. Ranging from mountainous landscape in the north to gentle hills and flat countryside of the south, Zakynthos, or Zante, has some of the most beautiful beaches to be found. The town of Zakynthos is located in the eastern part of the island, at the foot of Bohalis hill. It has gone through many hardships, the worst being the earthquake in 1953 and the fire that followed it. It has, however, managed to preserve many of its Venetian ornaments and is still as enticing as ever. Your stroll around town starts at the central Solomos Square, with the statue of Dionyssios Solomos, the Greek national poet dominating it. Here, your attention will be drawn to some very impressive buildings, such as the Town Hall building and that of the National Bank as well as the church of Agios Nikolaos. Walking down the central Dimokratias Street one ends up at the Agios Markos Square, named after the neighboring church. At a small distance one see the Solomos Museum, which is definitely worth a visit. 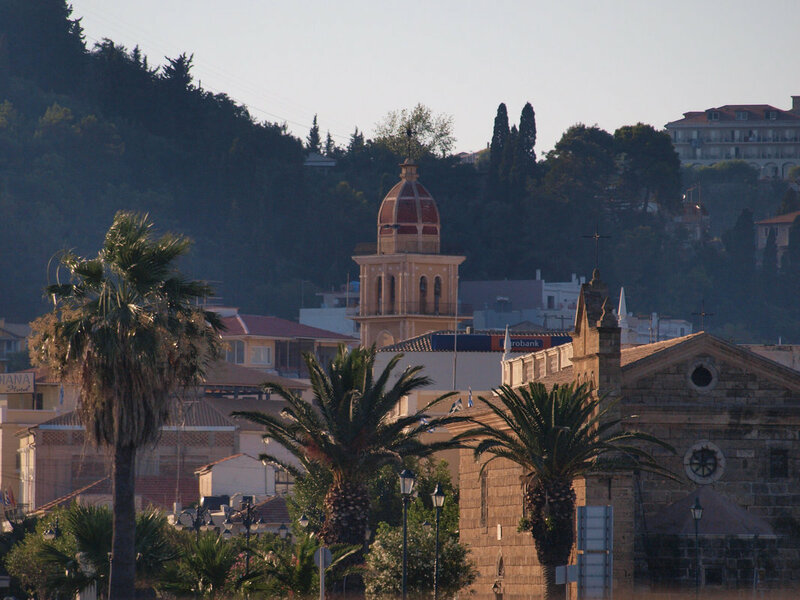 Agios Dionissios Church, dominant at the port, is dedicated to the patron Saint of Zakynthos and it is a landmark not only for the town but for the whole island. The original church was destroyed in 1893 at the big earthquake that hit the island and was rebuilt in August 1948 in its present form. The very warm waters that wash the coast favor a particularly long tourist season and make Zakynthos an object of international interest especially because in the southern part of the island the Caretta-Caretta turtles breed; they are a rare specimen protected by the Greek legislation with a new marine park. Along the rocky, western coasts the seals Monachus-Monachus breed too and they are also protected by the local administrative authorities. For additional information on the island of Zakynthos and a selection of accommodation choices, you may consult the relevant Booking page! The museum opened to the public in 1960. 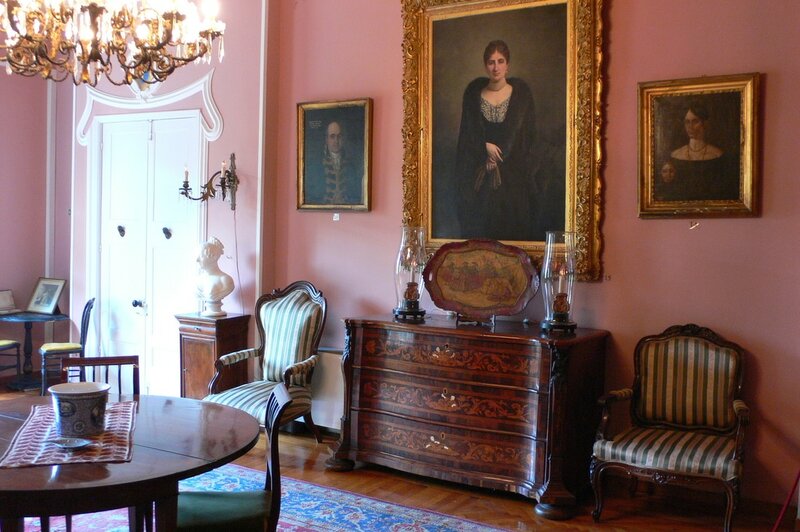 The visitor can admire three levels of Byzantine icons carved in the wood, original frescoes of the 15th, 16th and 17th Century, paintings of the 18th Century and oils on canvas of local artists like Doxaras, Koutouzis and Kantouni. Join an unforgettable escorted cruise to the North of the Island. Cruise past the residential area of Krioneri, the resort areas of Tsilivi, Alykanas and Alikes, up to Skinari, where you can see the lighthouse. Also, just off the port of Agios Nicholas at Skinari there is a small island in the shape of a turtle, officially belonging to the Vatican as it was not ceded to Greece along with the rest of the Ionian Islands in the 18th Century. From this point the island of Kefalonia can be seen. The boat then sails fairly close to the famous Blue Caves. Their name derived from the color of the water, a mixture of aquamarine and turquoise. This area is also the deepest part of the Mediterranean called the Well of Ionysos, which is about 4,500 meters deep. Heading onto Smugglers Cove, where the wreck of the ship “Panayiotis” can be seen, and a stop for a wonderful swim in the lovely blue waters. 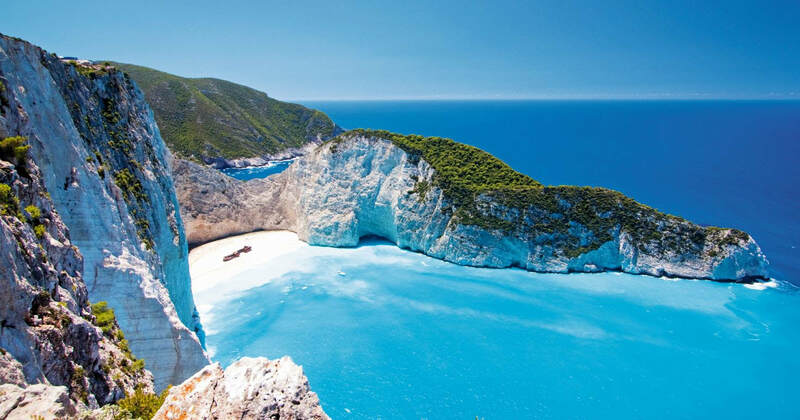 Navagio (shipwreck) Beach is rewarded as TripAdvisor traveler's choice 2013. This beach is not sandy but has small white pebbles. The then turns around and cruises around the north coast and the captain will make other swim stop(s) during the afternoon before arriving back at the town port at about 16.30. Your day cruise begins at the port of Agios Sostis, where your boat will await you. to embark on your 3-hour cruise tour taking in the beautiful scenery. Sailing south to the stunning Keri Caves for your first stop where you will have some fantastic photo opportunities. From here you will cruise to the small island of Marathonissi, situated in Laganas Bay. The nature on this tiny island is purely exotic as there are no inhabitants. Here you will have approximately 30 minutes swimming stop, in the clear blue waters. Back on to the boat now, where you will gently cruise around Marathonissi and Laganas Bay for turtle spotting. 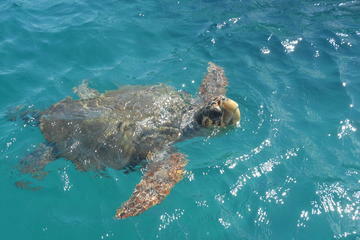 The Caretta-Caretta is a protected species and is one of Zakynthos' most famous inhabitants. Returning to Agios Sostis port, where your coaches will be waiting to return you to your resorts. Beach at the small island Marathonissi, off Zakynthos. The Venetian Fortress of the island, built in 1480, stands on top of Bohalis Hill. It was built where the walls of the ancient acropolis used to be. From here one can enjoy the panoramic view of the town of Zakynthos. Part of it was destroyed by the Turkish invasions and the Venetians gave it its present form in 1646. During the reconstruction from the Venetians, the main paved street was opened. The grand Gate and the canons were also added as well as the entrance gate, in which the marks of Venetian rule are obvious, such as the Lion of Agios Markos, a characteristic Venetian symbol, found on its upper part. The most important buildings of the fortress are the 12th c. Byzantine church of Sotiras or Pantokratoras, the 14th c. three-aisled basilica of Agios Frangiskos, the 15th c. church of Agios Ioannnis Prodromos and the single-aisled basilica of Agia Barvara, the Venetian prisons and the gunpowder storage room, the English Officers' sports field, the British parliament building and the barracks. for kids and adults, under the directions of the accomplished artist Dionysia Avouri, the owner of the Adamieion Ceramic Art Studio. The studio is located among olive trees and vineyards. Enjoy fresh homemade lemonade while your kids are being creative, away from the noisy tourist resorts. 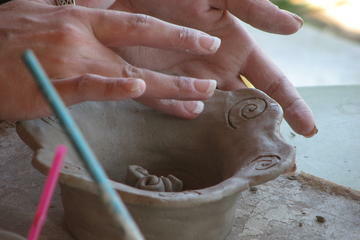 You have the opportunity to create your own souvenirs - memories from Zakynthos. but also time for swimming and plenty of Turtle spotting.